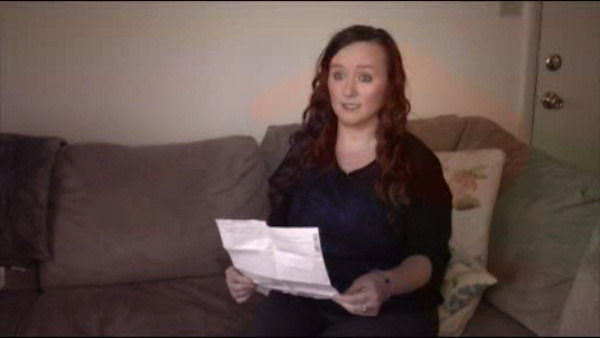 MIAMISBURG, Ohio -- A disabled woman's struggle to regain independence is going viral, after a neighbor left her a nasty note. 26-year-old Ashley Brady lost her leg in an accident in 2014. After learning how to walk again with a prosthetic, climbing three flights of stairs to her apartment is the easy part of her day. "I struggled a lot across the snow and ice in the parking lot trying to learn how to balance and walk," Brady said, "I fell multiple times all of which my neighbors have seen." After moving in, she asked the management at her Miamisburg, Ohio apartment complex to create a designated handicapped parking space outside her building, so she could avoid any more icy falls. "I finally get my handicapped parking spot last Thursday (March 12, 2015) and then I come home on Saturday and they're parking in my parking spot," she said. A frustrated Brady decided to leave a note when she didn't see a placard on the car parked in the handicap spot. "I was stern and confident in what I was saying and just letting her know she doesn't know what it's like to walk around without your own leg," Brady said, "She in return had placed this really rude note under my windshield wiper." "Hey handicap! First, never place your hands on my car again! Second, honey you ain't the only one with "struggles." You want pity go to a one leg support group! You messed with the wrong one! I don't care what your note said shove it, but you touch my car again I will file a report, I am not playing! I let the office know the cry baby one leg touches my property I will cause trouble so go cry your struggles to someone who cares cause I'm walking away with both mine! - (expletive)"
"I read it probably like 5 times over and over," Brady said, "Because my brain just couldn't even process the level of mean that it was." "If this person really knew her they would never talk to her that way because she's so sweet and would never talk to them that way," said Brady's sister Kaitlyn. Ashley Brady's sisters posted a picture of the note on Facebook in hopes of bringing awareness to struggles handicapped people face on a regular basis. The photo was shared more than 1,000 times in two days. "I got a lot of feedback online from a lot of other amputees who have been in similar situations," said Brady, "You're not just going to get what you want by bullying. She told me to cry to someone who cares, so I went to the internet and it turns out a lot of people care." Brady filed a grievance with Miamisburg police. Management of the apartment complex have not yet decided on a course of action for the incident.